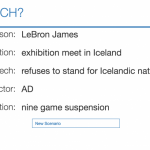 Talking to Dan about his sports law course resulted in this random generator which might be fun for others. It’s still developing but I like the potential for reinforcing some concepts about free speech in a fun way that allows you to repeatedly explore the topic without it getting tedious. I thought this would be a few minutes of work but I believe that Google has shifted the structure of their JSON feeds from the Spreadsheet. It could also be that I am insane. This particular experience did remind, rather unpleasantly, that I don’t fully understand how nested JSON parsing works. I ended up in the right place but only through about 40 minutes of slamming my head into various walls of misunderstanding. I also need to spend a bit of time applying the DRY concept to this bloated mess.